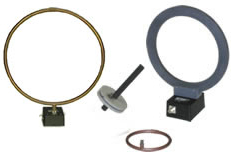 The small size of these loop antennas has the advantage of convenience in handling, availability of a zero- response orientation, and a simple expression for the voltage produced by a given field strength. At higher frequencies, about above 100 MHz, a loop of practical size may no longer be electrically small and has a significant response to the electric field as well as the magnetic field. For more downloads and information on the A.H. Systems Loop Antennas, visit their webpage.